This morning Square-Enix added a pair of new test servers that give all players 2 of the 4 special items that will be available to players at launch. The first of which is the classic Onion Helm that will be available to those players who will purchase the collector’s edition on the 22nd. The helm is… well you can be the judge of how it looks. Personally, I am not a fan. The helm itself is actually worse than the starter helm you get with the marauder class. However, it does have a trade-off. As you can see in the video, you will receive 2-3% damage reduction versus all physical damage types. In typical Square-Enix fashion, the helm has a hidden effect. Dying while wearing the helm or equipping it after death (and return) will cut your weakness from 5 minutes to a mere 1minute 30 seconds. The second item available to preview will be obtainable if you redeemed your Bonus Item code from the PS3 version of Final Fantasy XII. The better looking piece of the two, these gloves have only slightly better stats than the level 1 gloves that some classes start the game with. This item however, currently has an unknown hidden effect. Even if it doesn’t have a hidden effect, these gloves are a wonderful starter pair for anyone. The Output and Control on them make them a wonderful addition to gathering and crafting classes as well. The Open Beta is set to close in only four days (Sept 19th). Remember you can reserve your character name by registering and participating in this stage of the game’s testing. So if you are planning on giving the game a go, its well worth taking the time to check it out now. This new video popped up the other day. It looks quite professionally done and attempts to dispel the myths and confusion on how the experience and fatigue system works in Final Fantasy XIV. I will be fairly blunt and say that while the video has a pro-SE slant to it, it does explain the system and its intentions quite well. However it glosses over the issues people have against the system. I am still not sold on the Fatigue system, but it is a lot less problematic with the increased thresholds Square-Enix has implemented in the latest build of the beta. The system still punishes players instead of rewarding them. It still cuts off 100% of all skill and experience point gain after the 15th threshold instead of allowing a reasonable gain. The system itself is being pushed out there in the wrong way and most players will continue to see it in a negative light no matter what SE does with it in the future. If they had a decent public relations team, they would have worded the system differently and announced it in such a way. No matter what the video suggest, the system is a punishing one. It may be a different method from a steep leveling curve, but it is still punishing. It has its upside though, I will admit that. Yet forcing players to level something they don’t want to level just to continue playing the game is a big sticking point with me. A lot of people are going to hit their 8th threshold and call it for a few days. On a separate note, the beta is set to shut down on September 20th. So if you haven’t had a chance to jump in, you better do so now. Especially seeing that the game download takes about 3 days with the SE download servers. A major part of the world of Vana’diel was its relatively archaic methods of travel. Unlike other games where you could simply click on a flightmaster and be teleported or whisked off on wings of a beast (or in some cases your own), FFXI gave you a system of either Chocobo mounts, Airships and the more traditional Ships. Eorzea is a new land, but it retains Vana’diel’s basic modes of travel. Currently in the Beta, Airships and Chocobo’s are unavailable. So that leaves the one and only Ship. Taking into account this is still Beta and things are bound to change, but the experience is a bit lacking compared to its predecessor. It’s not any one big thing that makes me say it’s lacking. The little touches that were there in Final Fantasy XI that are missing that make it so. The simple fact that you can not get on the ship when it arrives is a huge deal to me. Waiting on the dock staring at a door that opens for you but you can not enter is extremely frustrating. In Vana’diel these ferry trips were used for travel but they were also a major source of fishing skill ups. Some of the most rare fish (and monsters) could only be fished up while taking a boat ride. 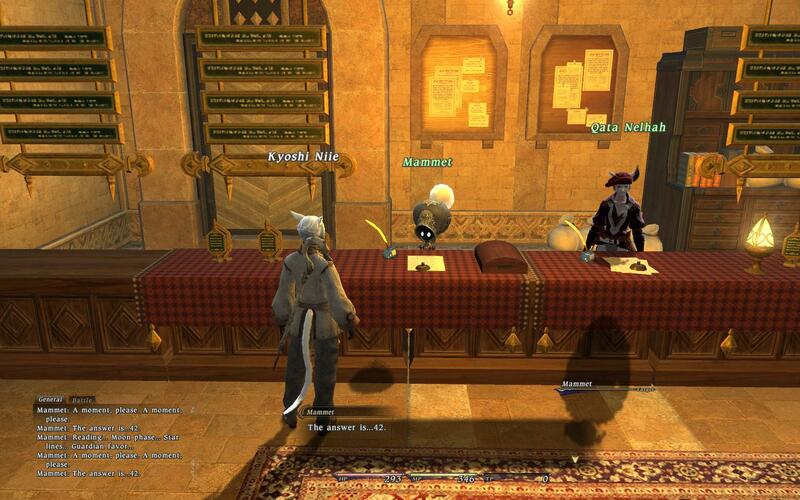 This seems to continue on in the seas of Eorzea. While we do not know if fishing has the capability of fishing up monsters, fishing is still the most important part of a ferry-boat ride. Unfortunately, unlike the ships of Vana’diel, this ferry does not hold a shop that sells fishing bait and poles. This would not be such a huge deal if the only shop that does sell bait on either side of the trip is at the Fishing Guild in Limsa Lominsa itself. The boat itself is a new and interesting model. It is pretty much the same model as the boat from the Limsa Lominsa tutorial sequence. Yet you get to explore it a tad bit more. There is very little to the boat. It some how feels a good deal smaller than that of the ferry boats of Vana’diel. Not having an enclosed cabin with the captain is only one of many differences. The benches in the hold are quite an interesting addition. However, the fact that you can’t see out of the many windows is quite annoying for a game of this level of graphical detail. What the boat lacks is something that the entire world lacks, life. With only a single NPC and no monsters it just does not feel nearly the same as a trip on the Mhuara-Selbina ferry did 8 years ago. I have a feeling that the lack of monsters on the boat trip is just a matter of this being a beta. At least it is my most fervent hope. I would also hope that they do eventually add the “anti-RMT” device that is catching monsters. This was a mechanic that was used more and more as a farming tool by numerous players in FFXI and does have a place in Eorzea as well. I did edit a decent chunk of the video out. but left in quite a bit at the end just to let you see the attention to detail that remains in the boat ride. Like its predecessor, XIV shows you the surrounding land masses as you sail to your destination. In this case there is only one, that of Limsa Lominsa and its volcanic center. Notice how it does get closer and with it, raises the level of detail. It would seem that I am being fairly negative about this game as of late. I am trying extremely hard to give it a fair shake. I have played since Alpha so I do have a bit of a wider view on the state of the game than some and friends have been telling me I need to take a step back and look a the current game for what it is. Well, as I make an attempt to do just that, I will give you my first observation of what it is I see. The video above is a short little 4 minute jaunt around the northern portion of Thanalan. It is a scenic little trip along a cliffside path that leads to the higher level region to the north. Most roads in Eorzea are safe pathways to travel. There are a very limited amount of monsters above ground in the available regions we have to explore. Combine that with there being only a handful of these monsters that actually prove to be aggressive, we should have a fairly easy time traversing the land. That is until you suddenly are aggroed by a crow. Now to my memory there is not a single crow or bird in Final Fantasy XI that is aggressive outside of Maze Mongers. So this was an extreme surprise. Combine that with the two major issue the game has when it comes to aggressive monsters in the field and you have an unhappy player. 1) The server/zone architecture causes monsters to suddenly appear. This is not World of Warcraft. The term “seamless” means something entirely different in XIV than it does in Blizzard’s game. We only have the illusion of a seamless world. Each subzone is its own zone. Monsters can NOT attack you or follow you as you cross the boundary between zones. Nor can you see monsters on the other side of a boundary. This presents major issues when monster’s have a path that leads them to the edge of a zone. You may have noticed that sometimes people have grey names. This is because of the zoning issues. If you ever try to follow a friend between zones you will notice them blink out of existence and back in, and often times they will have a grey name when they return. Telling you that they are either in another zone or that they are still loading. What does this mean in terms of gameplay? That zonelines are not gone, we just can’t see them. That when approaching zonelines we need to be ready for anything. There are several zones in particular that monsters will appear suddenly and unexpectedly and instantly kill you. The video shows one such zone. 2) The lack of any audio cue when a monster becomes engaged with you. Coming soon, a more complete list of the current issues with the game. Not to be unfair, a list of well done aspects of the game is in the works as well. Since the Open Beta began there really hasn’t been much to share that hasn’t been shared elsewhere. However, I wanted to try to elaborate on my exploration of Gridania as a starting city. The video below shows how vast the city-state actually is. I even edited out a large chunk of the backtracking involved in circumnavigating the city. Like Windurst, a lot of the city is not needed by everyone, but unlike Windurst (or any other Final Fantasy XI city for that matter), there are no real “useless” areas. There is no Rhinostery here. Since there are no quests in the game outside of the main mission series and guildleve’s the city seems actually quite large and small at the same time. 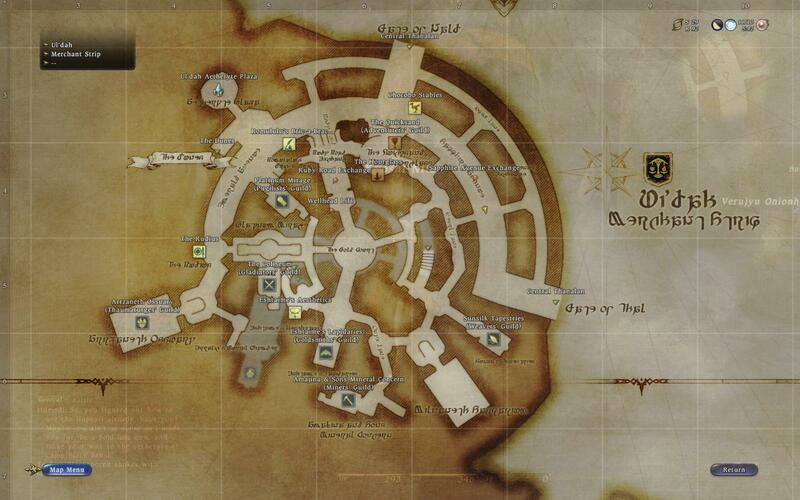 As you can see there are really only 2 areas of the city that are “generic” and non-guild or NPC storefront areas. The amphitheater being the most important one, but one completely void of NPCs. This area is only here for use in the city missions. Then you have the closed off area to the north that is more than likely the political seat of the city. All three cities have their own version of this closed off area. The city itself is a beautiful site. All the greenery and water everywhere brings you back to Windurst of old. It’s just truly unfortunate that there is very little “life” in the city. Sure the city has its fair share of NPCs, but most of them are generic guards and shop keeps. Some are even just there for show since you can’t even speak to them. There are no NPCs with stories of their own. You do not get drawn into the story of the townspeople like you did with its predecessor. There are remnants of the Star Onion Brigade with the kids in the playground, and we do get to learn more about them thanks to the city mission set, it’s simply not the same. The experience is brightened by the graphics. Between wildflowers, flowing water everywhere and the beautiful pseudo star tree cave system the town is gorgeous. Yesterday we took a look at the second city of Eorzea with our trek around Gridania’s lush forest setting. Today we are taking a step into the Savannah type desert setting that attempts to bring the city of Ul’dah alive. If Gridania is “Windurst in a forest” then Ul’dah is most definitely “Bastok in a desert”. The more I thought about how to compare each city to its FFXI predecessors, the more it actually began to crystalize in my mind eye of what the development team actually did with the three Eorzean cities. In FFXI, Windurst is a very green and water filled city but it located in a very desolate type place. Sarutabaruta is a Savannah type desert location with Tahrongi, Buburimu, Meriphataud and Sauromonge most definitely full on dirt ground deserts. Where San’doria is a very lush and green set of regions. With three separate forest zones and a prominent waterway connecting them. Then Bastok is a very rocky, seaside cliff area moving into greener areas as you move towards the Highlands. In FFXIV we see three very similar starting area climates but the nature of the cities that make those climates their home has been shifted by one. Gridania is Windurst in a forest, just as much as Limsa Lominsa is San d’Oria amonst the rocky cliffs. Leaving Ul’dah as Bastok in the Savannah. The beauty of the design is that each city feels incredibly familar and yet is different enough to not be the same old thing with a new coat of paint. The Think, Feel… theme is here once again in the opening cutscenes of the city. Which while has less “action” than the other two cities, focuses the action much better. Your focus is a runaway goobue and the actual character interaction between multiple characters. This is a huge step forward from Limsa Lominsa’s opener where the two characters introduced in its scene are really uninteresting and completely underdeveloped. You actually get a feel of who these characters are, and there are 6 of them in this opener compared to a mere two in Limsa’s. Ul’dah’s concentric circle based layout radiates from the Adventurer’s Guild (AG) very near its center. Making the city the most well thought out of the three city-states. We start our adventure in the AG which allows us easy access to the city in its entirety. Both of the shopping districts are conveniently located within seconds of the AG as well is the elevator to the upper level where you are treated to a beautiful view of the multilevel fountain/planter system that is the centerpiece for the city. Once on this level you may also choose to visit the Alchemists’ Guild for your concoction needs. The desert city is home to a number of other guilds as well. Within the city walls an Adventurer may find the Gladiator and Pugilist Guilds as well as the Thaumaturge guild is located nearby in the western quadrant of the fortress. The Gladiator’s guild itself is a sightseeing destination as you can see combatants fighting to the “death” in the Coliseum. All the while being safe from randomly thrown weaponry or spells by remaining well above the fray. The several Discipline of the Land and Hand guilds that make Ul’dah their home can be found quite close together in the southern area of the city. The only downside of the guilds’ location is that they are a bit far from the Market Wards. Yet even with their lack of proximity, they are still much closer than the majority of guilds in the other two starter locales. Isn't that always the answer? Ul’dah does have a bit of a flare compared to Limsa Lominsa and Gridania as it is the home of the game’s version of a casino. While this is currently not functional in the beta, many players are looking forward to seeing what sort of traditional Final Fantasy mini-game fun will be had within the Platinum Mirage’s walls. Each city has its own specific look and feel that goes along with it. Ul’dah definitely has a wonderfully familiar vibe to it that makes you feel right at home when you first start running around its tall earthen walls. The concentric design allows for easy travel and more importantly, easy to memorize guild, elevator and Market Ward locations. Match that with two easy to access gates to the outside world and an Aetheryte crystal that is close to the outside world as well as Market Wards and the AG you are bound to be a happy camper starting in this desert city. When combined with the fact that the Platinum Mirage is here and will no doubt be some place that the developers intend as a hub for player activity outside the guildleve and grinding that the rest of the game has to offer, this city will more than likely become the “Jeuno” of Final Fantasy XIV. The only thing the city is missing at this moment is easy access to an airship dock. As a matter of fact out of all three cities, only Gridania has an Airship Dock within in the city walls. This could be a make or break for some players when starting out. However, if there is an “Airship Pass” questline like in FFXI, it will fast become a moot point. I am torn right now as to whether I want to start in Ul’dah or Gridania. Only a little more time will tell. As always, after the break is a number screenshots from around town for you to look at your leisure. Read the rest of this entry ? 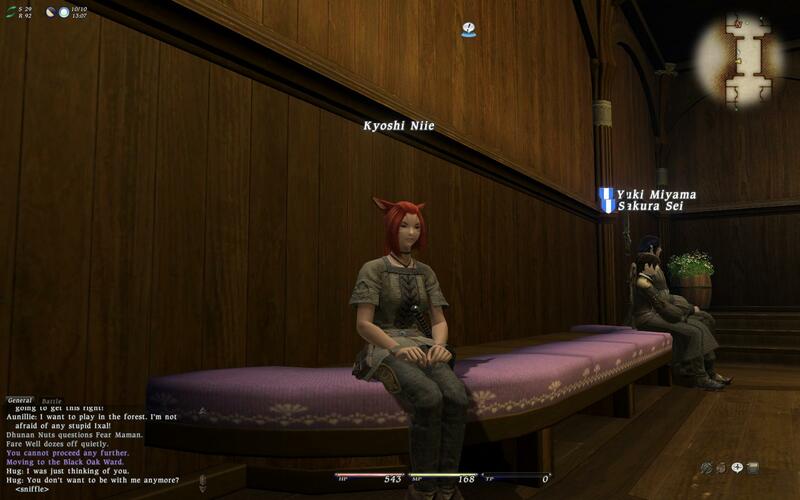 The Final Fantasy XIV Open Beta test is finally here. If you can get in, more power to you. The test application site along with the game and the overall Square-Enix ID site has been extremely congested since the launch of the test last night. They are continually giving out beta keys and then ceasing to do so every few hours now, so keep trying over at entry.ffxiv.com if you want to experience what the game has to offer for yourself. 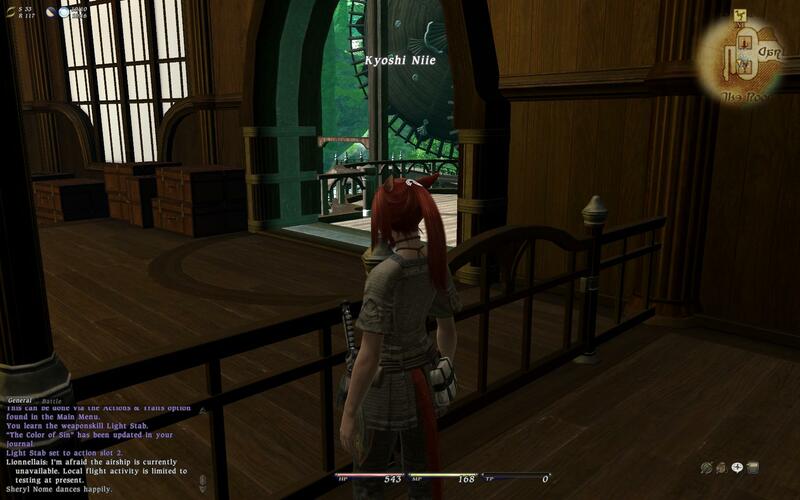 If you can’t get your own key, here is the place to be to see the sites and sounds of Eorzea. A good friend of mine made this hi-res video of the opening sequence of the forest stronghold of Gridania. Unlike Limsa Lominsa, you do not start being asleep on a boat you start out on a… well just watch the video. In my person opinion it is better than its sea fairing counterpart. Even if SE likes to be a little pervy with its female characters. As you can no doubt see the world around Gridania is a very different place than Limsa Lominsa. The stronghold is found at the center of a lush green forest. The forest setting is used everywhere in the city. We are surrounded by a very similar feeling as we once had in Windurst back in the games predecessor. Like Windurst, it has many flowing streams and fresh water is a main theme of the area. Along with the woody forest atmosphere we are taken away by a city that is ever so much like a cross between Windurst and something from another Final Fantasy game, Guadosalam from FFX. While it is a wonderful thing to mimic the look and feel of a modern Windurst, it is an entirely different thing to want to mimic its layout. Unfortunately, Gridania is laid out very similar to a modern Windurst Walls. The stronghold is basically a large circle with most of the needed areas inhabiting the outer edge of the circle. While the exits of the city are long Windurst Canopied paths and tunnels that take a decent amount of time to traverse to reach the outer forest. In the outer lying areas of the stronghold you will find such things as the Conjurer’s guild deep in a cave to the north. Or deep to the southeast you will find the Archer’s guild. The one bright spot of this particular city is that there is not nearly as many elevations and stairs to navigate to get from one point to another. It is perhaps the most straight forwards of the three cities in that regard. You may have to spend some time running between place to place, but in the end it is far more easy to navigate for a new player than Limsa Lominsa is. Benches we can sit on! The Market Wards are located in the “Lotus Gardens and are much more aesthetically pleasing that LL’s as well. Complete with built-in benches where you can actually choose to sit. (This in and of itself is a HUGE step forward from FFXI. We can only hope that SE has a few more tricks up its sleeve for the launch in several weeks.) Not only do they feel more like the zone they belong in, they are infinitely easier to get to. Besides the actual duration it takes to get from point to point, the biggest downside of the city has to be the location of the Adventurer’s Guild (AG). 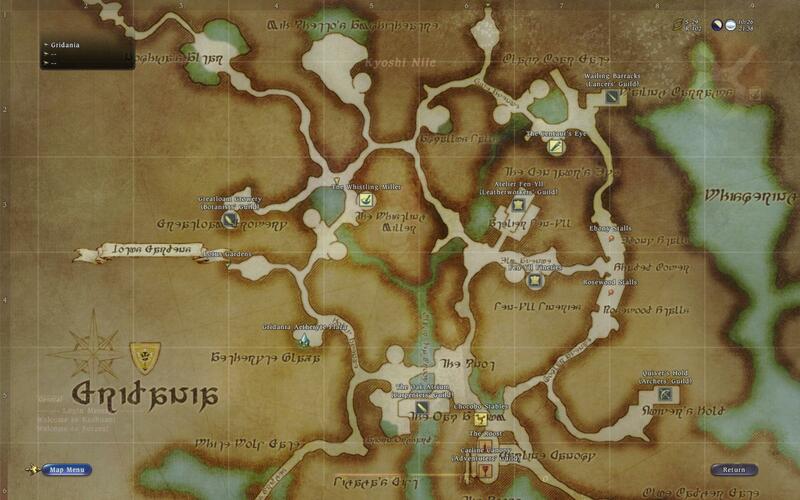 Now if you are new to FFXIV, the Adventurer’s Guild in any of the three cities is the key hub to the location. It is the place where you hire and fire retainers, create linkshells, and obtain guildleves for both crafting and adventuring. Gridania’s AG is located in the far southeastern portion of the town. It is a hop skip and a jump from the outer gates of the stronghold, but is nowhere near centrally located like its Uldah and Limsa Lominsa counterparts. Making it a very long treck to go from the AG to any other portion of the city. This could be a good thing or a bad thing depending on how you look at it. If you are a Conjurer or Lancer, this becomes a fair bit of a problem, but if you are a member of one of the guilds located only steps from the AG, then you are loving life. The biggest perk of Gridania’s AG is the fact that the Airship Dock is situated inside the AG itself. If you want to head on out to a different city (something that is not currently available in the beta) you will be able to take mere steps downstairs and hop on the most conveniently placed transportation hub in the game. The town of Gridania may not be for everyone. Yet in my personal opinion the entire experience so far in the zone has been a leap beyond what Limsa Lominsa offered us in the Closed Alpha & Beta testing period. The overall feel of the zone is only multiplied by the wonderful town and city music that is dominant in the area. This is the closest to a Sanctuary of Zitah feeling I have had in this game at this point. Check beyond the break for a more extensive gallery of screenshots from the Opening Cutscene, a little battle and a look at a few of the sites of the city of Gridania. Read the rest of this entry ? You are currently browsing the archives for the Beta category.